While I was scrolling through my Facebook feed yesterday morning, I noticed an old high school friend of mine had shared a ton of photos, and I was immediately intrigued. She often shares insightful information about her son – who was diagnosed with high functioning autism and sensory processing disorder a couple of years ago – and on Saturday she took him to a newly opened sensory park near her home. It was filled with all kinds of swinging and spinning equipment, and all of the surfaces were finished with different sensory textures. It warmed my heart to see her son so happy, and her post got me thinking about another friend of mine who created a sensory room for her daughter several years ago. 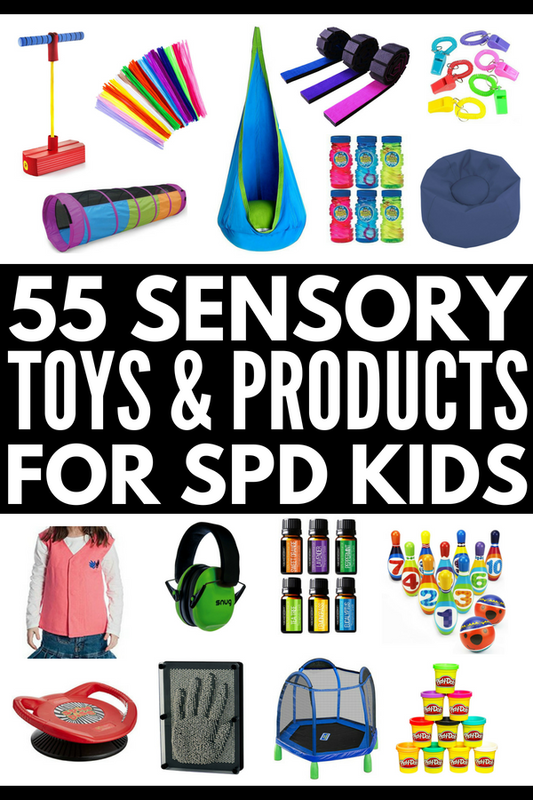 I remember being fascinated by all of the sensory room equipment she had setup in one single area of her home to help with each of her child’s challenges, and I found myself researching all things sensory processing disorder yesterday – how to create a multi sensory room, the best sensory room equipment for different sensory sensitivities, and sensory toys for autism and sensory processing disorder for productive, on-the-go fun. It is important to note that while many children with autism have a comorbid sensory processing disorder diagnosis, the two are very distinct disorders, and most kids with SPD do not fall on the autism spectrum. As the name implies, a sensory room is a dedicated space in which the sensory stimuli an individual experiences can be increased or decreased depending on her needs. Through the use of various sensory room equipment, therapists and caregivers can help a sensory sensitive child explore different sights, sounds, tastes, textures, and forms of movement in a safe environment. Repeated exposure helps improve a child’s level of tolerance to the things she finds overwhelming or difficult, which in turns helps her feel more confident in real life situations. While sensory rooms are an integral part of most therapeutic settings, and many schools have sensory room equipment available to sensory sensitive children, creating a multi sensory room at home allows greater personalization for your child’s needs. By consulting with an occupational therapist, you can create an individualized treatment plan with sensory products and toys designed to challenge your child’s individual senses, and you can easily add to your plan over time. Consider your child’s individual needs. You’ve probably noticed that most therapeutic clinics include the same sensory room equipment – swings, trampolines, ball pits, etc. – and while your child would probably benefit from each of these, creating a multi sensory room at home allows you to be more specific in the tools you use. Rather than looking at the sensory room equipment included in larger facilities, focus only on the areas your child struggles with and source products and toys for those specific needs. Find a quiet area in your home. Creating a multi sensory room at home can be challenging for those who live in tight quarters, and will require a little creativity. Instead of dedicating an entire room to your child’s sensory needs, you may need to share space or find a quiet corner in your main living area. You may even consider converting your garage into a therapy gym or installing a portable cabin outside your home. Whatever option you decide to go with, remember to pick an area that is quiet and free of distractions, that’s well-ventilated, and that you can darken if needed. Include a place to calm down. When trying to increase your child’s tolerance to certain sensory stimuli, it’s important to have a place for her to retreat to when she feels overwhelmed. This could be as simple as placing a bean bag, weighted blanket, noise-canceling headphones, books, and squeeze toys in the corner of your sensory room, and if your child needs a darker, more private space, a small room tent may be just the option you’re looking for! Develop (and stick to) a routine. It’s no secret that children thrive on consistency and routine, and this is especially important for kids with developmental delays like autism and sensory processing disorder. Make it a point to develop a routine for your child to follow while exploring her sensory room, and try to stick to it as best you can. You want the transition in and out of the sensory room to be as seamless as possible, and consistency is key in making this successful. Look for cheap(er) alternatives. Don’t allow the costs associated with sensory room equipment scare you. Search for second-hand products online, visit garage sales and thrift stores, and don’t be afraid to make your own items! Stop aiming for perfection and settle for substitutions wherever possible. Exercise balls offer similar movement benefits as swings, a pile of pillows covered in a blanket is just as effective as an expensive crashmat, and these DIY calm down bottles work just as well as a lava lamp. Use your creativity, get your kids involved (if you can), and keep it fun. The proprioceptive system is responsible for helping us understand where we are in relation to the space around us. Our proprioceptive receptors exist in our muscles, joints, and ligaments, and these receptors are what enable us to sit, stand, stretch, bend over, climb stairs, run, etc. Weighted Vests. Weighted vests are an excellent way to provide proprioceptive input while simultaneously calming a child and allowing her to focus. Many children say the weight of the vest mimics that of a deep hug, which can be extremely helpful for kids with proprioceptive dysfunction. I especially like these weighted vests as they are adjustable and you can change the weight as required as your child grows. Sensory Sack. Sensory sacks are one of my favorite sensory room equipment ideas for kids who need calming proprioceptive input because they take up very little room, making them the perfect travel accessory for sensory sensitive kids. These sacks provide deep pressure and resistance, and can calm a variety of different feelings and emotions. Squeeze Machine. The cushioned foam rollers on this piece of sensory room equipment squeeze and release pressure evenly and consistently as a child moves through it, allowing her to receive calming proprioceptive input and massage when needed. Deep Pressure Foam Roller. If a squeeze machine is out of your budget and/or you don’t have room to accommodate one in your home, this deep pressure foam roller is a fabulous alternative you can also use while you’re on the go. Roll it over your child’s back, legs, and shoulders to provide deep pressure massage and joint compression when she needs it most. Yuk-E-Ball Medicine Ball. Perfect for sitting, squishing, catching, stacking, rolling, and balancing, these medicine balls offer a simple way to provide proprioceptive input to the joints and are a fabulous addition to any sensory room. Trampoline. Whether you have the space in your backyard for a big trampoline, or need a small trampoline to use indoors, providing your child the chance to jump is a great form of proprioceptive input that has the added benefit of burning off energy! Often referred to as the ‘sixth sense’, our vestibular system is located in our inner ears and is responsible for our spatial awareness. It allows us to coordinate balance with movement and, when performing correctly, it works in conjunction with our other senses to ensure we feel safe in our environment. A child with vestibular processing challenges may avoid or seek vestibular input. They may appear clumsy, prefer sedentary activities, and have difficulty with fine motor tasks like handwriting, or they may be hyperactive and impulsive due to a constant need for movement. Play Tunnel. You can do so many things with a basic play tunnel, and I love this 4-sided option as it’s much more versatile. Place some of your child’s favorite books and toys in the center and have her crawl through the different openings to retrieve them. She can practice crawling forwards and backwards – the possibilities really are endless! Foam Pogo Jumper. Suitable for kids and adults up to 250 lbs, this sensory room equipment idea is a little easier than your standard pogo jumper, making it an excellent (and fun) sensory product for kids who seek and avoid vestibular input. I particularly love the fact that it can be used indoors as it provides a great way to burn off energy on bad weather days! Swing. A post about sensory room equipment wouldn’t be complete without a swing recommendation, and if your child has vestibular processing challenges, a sensory swing could be a life-changer for her. There are so many different options available, and you obviously need to choose the one that works best for your child and the space available to her, but if you’re looking for recommendations, I’ve heard nothing but positive things about this Lycra Snuggle Swing. Balance Board. If your child struggles with balance and coordination, this is a fun and small sensory room equipment idea to consider. You can use it outside or inside, making it a great way for kids to blow off some steam on bad weather days, and it can withstand up to 200 lbs, so it’s perfect for kids of all ages and sizes. Spin Disc. If your child likes to spin, this is a sensory product to consider adding to your sensory room. I get dizzy just looking at it, but I’ve heard many parents recommend spin discs as a form of vestibular input for little ones. Climbing Wall. Climbing is another great activity for kids who seek or avoid vestibular input, and if you have the space, creating a climbing wall for your child with these rock climbing holds is a fabulous idea to consider. If your child has tactile sensitivities (think: textures, temperature, vibration, pain, etc. ), engaging her in tactile sensory integration activities will help teach her to understand which tactile stimuli are important (the feeling they get when they cut their finger) and which aren’t (the feeling of the tag on the back of their shirt). There are so many fun sensory activities you can engage your child in to make her more tolerant to different textures (we have 101 ideas HERE if you’re interested! ), and if you’re incorporating them into a sensory room, I suggest setting up 3 or so activities and toys on a small table so your child can explore. You can change these out every few days so she doesn’t grow tired of them. Our auditory system is responsible not only for enabling us to receive auditory input from our environment, but it also helps us to recognize which sounds are important (the sound of mom calling your name), which ones keep us safe (fire alarms), and which ones we should ignore (the hum of the fridge). Some children with auditory processing disorder may be hypersensitive to sounds, causing them to become upset in the face of loud noises and cover their ears in public settings, while others may be hyposensitive and seek out loud noises. If your child has auditory processing challenges, consider equipping her sensory room with a wireless speaker so you can stream different types of music at various sound levels directly from your smartphone. If you’re looking for speaker recommendations, I am a HUGE fan of the Sonos Play:1 Speakers. Our oral system allows us to communicate with others, and also allows us to chew, swallow, and experience different textures and tastes, but what few of us realize is that our oral system is also closely related to our proprioceptive system. For example, you might notice that your child is constantly chewing and biting things (oral seeking behaviors), or your child might avoid certain food textures, have problems swallowing, and be very reluctant to try new foods (oral avoiding behaviors). If this sounds like your child, there aren’t a lot of sensory room equipment ideas I can suggest, but there are a ton of fun oral sensory activities you can engage your child in as part of her sensory diet. Bowling. Bowling is a super fun hand eye coordination exercise, and you can easily make your own set using empty water bottles and a soft ball. You can make this easy at first by using a bigger ball, and move to a smaller ball as your child gets the hang of the movements required to knock all of the ‘pins’ down. Too lazy to make your own set? Buy your own kids bowling set here! Balance Beam. Of course, not many of us have balance beams lying around in our basements (LOL), but you can easily replicate the idea of walking on a balance beam by having your child walk along a piece of masking tape. You can also buy a roll-up balance beam if needed. Scissors. Teaching kids how to cut with scissors can be tricky, especially if they struggle with hand eye coordination. Start with playdoh and a pair of playdoh scissors, and then check out these scissor activities for kids. Pipe Cleaners. There are so many fun kids activities you can do using pipe cleaners. You can thread them through the holes of a colander, slide beads onto them, cut them in half and ask your child to drop them into the neck of a water bottle…the possibilities are endless. Pounding Bench. Alright, so I wouldn’t use a real hammer and nails for this activity (HAHA! ), but Melissa and Doug’s Pounding Bench is a great hand eye coordination toy. Fishing Game. I’ve seen moms create their own fishing games for their kids by tying paper clips to the end of a piece of string, and then having their kids ‘fish’ magnetic letters out of a bowl, but if you’re not a DIY-er, Melissa and Doug’s Catch and Count Fishing Game is just as good! In order for a sensory room to be effective, you need to make sure your child has a place to retreat to when she feels overwhelmed. This may require a bit of prompting from you at first (‘I notice you’re feeling a little frustrated. Why don’t you go to the Calm Down Corner for a few minutes?’), but teaching your child how to recognize her emotions and equipping her with strategies to calm herself down before her emotions get out of hand is extremely valuable. Bean Bag. Bean bags are an excellent tool for kids with sensory processing disorder and/or autism. Many of these children find typical chairs to be uncomfortable, and the way the bean bag molds to their bodies and provides sensory input provides an added layer of comfort and security when they are feeling overwhelmed. Weighted Blanket. Weighted blankets are said to have the same calming effects of a deep hug, and they are particularly useful to kids with SPD and/or ASD who struggle with emotional regulation and/or sleep. These blankets are 5-10% of the child’s body weight and have gained significant popularity in recent years. Give one a try! Bubbles. Mindful breathing is a very effective calming strategy for kids and adults alike, but learning how to use this technique can be challenging, particularly for small children. A simple way to encourage deep breathing to help your child find her way back to a place of calm is to have her blow bubbles. This will force her to talk deep, calming breaths naturally, and the bubbles will serve as a fabulous secondary distraction. Noise Cancelling Headphones. If your child struggles with loud noises and you’re working on exposing her to different auditory sensory stimuli, a pair of children’s noise cancelling headphones is an absolute must for her sensory room as she can put them on for immediate relief when she needs to. Playdoh. Sensory tools like playdoh are great to include in your child’s calm down kit. Kneading, molding, stretching, and creating with playdoh can be extremely relaxing and calming, and it’s an inexpensive and portable option if your child needs an outlet while on the go. Calming Music. If you have a smart phone, you can easily download some of your child’s favorite tunes to listen to when she feels overwhelmed, which you can stream through a wireless speaker. You can opt for something instrumental and soothing, or find something you can rock out to together to help release nervous energy. It all comes down to personal preference and what works best for your child. Essential Oils. There are heaps of single oils you can purchase to help support your child with anxiety, and you can combine them together to make your own blends based on your child’s individual needs and struggles. Lavender oil soothes the body and mind; bergamot oil is a powerful relaxant and can reduce nervous tension, anxiety, and stress; roman chamomile oil can reduce mental anxiety, paranoia, and hostility; vetiver oil calms the sensory system and helps to stabilize emotions; and wild orange oil is a great mood booster that relaxes the nervous system, reduces stress, and promotes feelings of happiness. CLICK HERE for a great article on how to use essential oils to help kids with autism, sensory processing disorder, and anxiety. Temple Grandin once said, ‘The most important thing people did for me was to expose me to new things’, and while the idea of exposing your child to the sensory stimuli she struggles with most may seem overwhelming to you, I hope this collection of sensory room equipment ideas inspires you to put your creativity to the test. Remember that exposure doesn’t always need to be difficult and negative. Keep it manageable, make it fun, and remember to never (ever) give up hope. 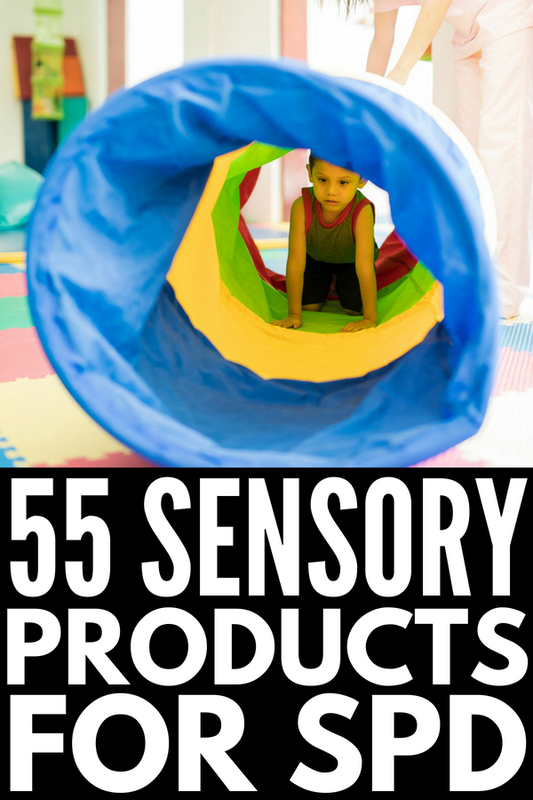 If you found this collection of sensory room equipment ideas helpful, please share this post on Pinterest! And if you’re looking for more advice relating to autism and sensory processing disorder, please follow our Autism and SPD board where we share all kinds of great ideas we find each day!